A robot capable of classifying and separating small items like mail packages has been developed by Yaskawa Electric, Mitsui & Co., Ltd., and packaging system manufacturer Hokusho Co., Ltd. 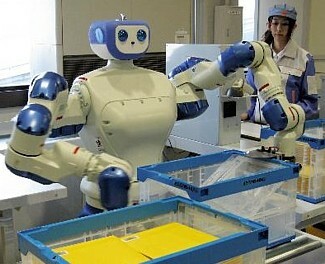 The robot upon which the system is based is Yaskawa's Motoman-DIA10; it has seven-axis robotic arms mounted on a human-sized torso. Hokusho's piece assorting system technology makes it a good backup or replacement for human sorters. Microsoft Robotics Studio adds support for Windows CE, powers a simulation soccer competition, and sees continuing broad adoption across hobbyist, academic and commercial segments. Microsoft Corp. today announced an improved version of Microsoft(R) Robotics Studio, just months after the December 2006 introduction of its robotics application development toolkit. The new Microsoft Robotics Studio 1.5 adds support for Windows(R) Embedded CE 6.0 and Windows Mobile(R) 6, which allows developers to more easily deploy advanced scenarios and software applications on embedded platforms of a wider variety and lower cost. We're constantly seeking ways to improve the product through new features and provide a catalyst to academic, hobbyist and commercial segments," said Tandy Trower, general manager of the Microsoft Robotics Group at Microsoft. GREENVILLE, N.Y.--(BUSINESS WIRE)--Applied Robotics Inc., a leading global manufacturer of robotic end-of-arm tooling and connectivity solutions, today announced the introduction of its new smart gripper. The Smart Gripper 2.0, designed for use in a laboratory setting to increase efficiency and flexibility, is also easily scalable for use in a variety of other industries and applications. The gripper features accurate robotic finger positioning, adjustable grip force, easy integration and requires no proprietary software or controllers. IXS Japan has announced a 4 legged walking robot which is developed in co-operation with Kondo science. 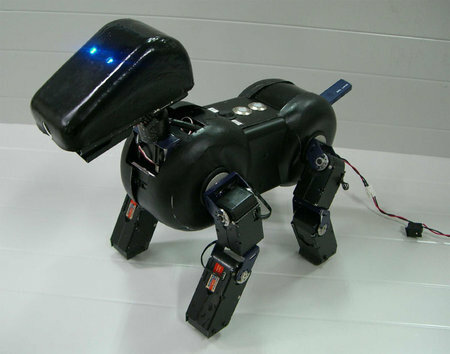 Named 'BJ' it is almost the same size as the Sony Aibo and with the production of Aibo discontinued BJ looks to be a suitable contender. It has 3 joints for each leg (12 in all), 2 for neck, 1 for jaw and 16 for tail. It is powered by an i.MX Core 11 CPU, 64MB RAM and 16MB Flash ROM. BJ has a 350,000 pixel CMOS sensor (30 fps), 1 x Distance sensor, 1 x Acceleration sensor and 4 x Metal sphere sensors. As for interface BJ can communicate using Ethernet slot, Memory stick Slot, 2 x USB ports and 3 x Serial ports. The unit runs on Linux and comes with iQRs03 Communicator a software using which you can program BJ to perform activities like walking, running etc. Inspired by an article they had published, journalists at New Scientist magazine decided to build a replica of a robot designed over 2000 years ago. Invented by Greek engineer Hero in 60AD for, the robot is programmable and moves autonomously. Ben Crystall of New Scientist stole the wheels from his son's scooter (thanks Dad!) and scavenged ropes and weights from an old sash window to build the three-wheeler. You find JRT website informative?